Growing up periods were seen as a shameful thing and they weren’t talked about. My mum never spoke to me about it. What I learnt was via friends at school when they talked about it when they started. I was a pretty late bloomer so I knew what to expect as most of my friends had started before me. However when you do hit puberty and they start then it can still be a bit of a shock. Back then (90’s) I didn’t have access to the internet to find out how to deal with it all…and I couldn’t face speaking to my mum about it; as a result it was a bit of a lonely time. If it wasn’t for my friends I would have been lost. When I told my mum one morning I had started I was just given some chunky sanitary pads with a frown…and then when I had a bath after told how to cleanse myself. That was the input I had. As I result I was determined that I wouldn’t put my daughter through that. That she would be able to talk to me freely when the time came…to be able to ask questions, to be able to discuss any problems with me and know what to do without having to talk to her friends all the time. Periods in our community can be seen as a shameful thing…sadly even in this day and age they can still be seen to be shameful…which was proved by a comment left on my facebook page talking about this issue. As a result I decided to write this blog post. As a society we need to talk about these things…it is a natural process and not disgusting or shameful. One of the first things is to ensure you have talked about it. As soon as you see signs of puberty then let her know about the changes that will be happening to her at some point. Girls are starting their periods at a younger age so it is best to do it sooner rather than later. Schools are also discussing these things earlier; wouldn’t you prefer if it was you she learnt off? If you do find it difficult to talk about these things then there are books to help you such as: A Muslim Girl’s Guide to Life’s Big Changes . You can read my review of the book here: Review of Muslim Girl’s Guide to Life’s Big Changes. 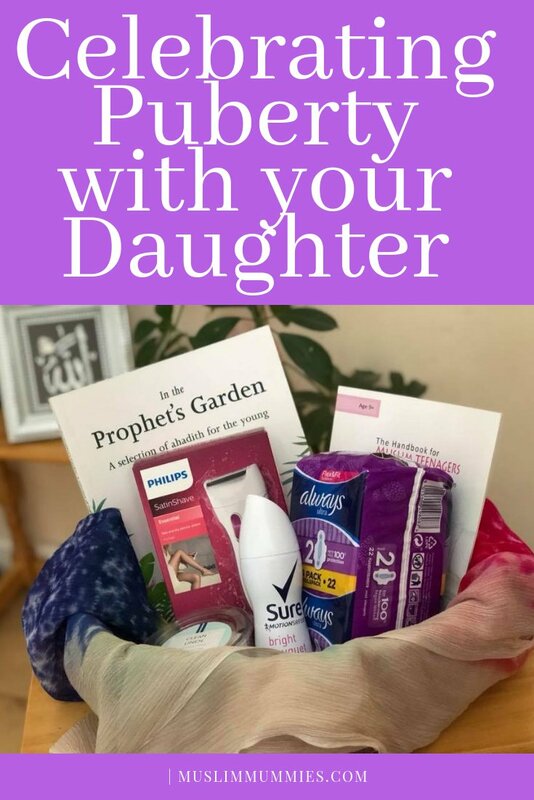 Another thing you can do is make a ‘Puberty Basket’ ready to give to your daughter when she starts. There are a number of things you can put in the basket based on what you as a mother may feel is necessary. One suggestion sent to me via a private message was a party to celebrate entering womanhood. The party was done with the girls and mums and aunts. They baked together, cakes and biscuits, and decorated in red. I must admit it was not something I had heard of before but it does seem like a nice idea to help bond more with your daughter also. I do feel like we are moving forwards from the days where girls were forced to pretend they were fasting/praying while on their periods so the men in the house didn’t know they were on their periods but there are still instances where people think these things do not need to be talked about. That they should be discussed behind closed doors and hidden from the men. Periods are nothing to be ashamed of..and we shouldn’t make our daughters feel like they have to be ashamed or hide it…or worse still feel dirty. If you liked this post then why not give it a pin on Pinterest. My Mum discussed it with me but it was still a bit embarrassing. Like you I decided to be totally honest and hide nothing from my daughter. I heard one great quote that if men had periods the would be billions of dollars poured into research and awareness. It is something even as woman that is still a big mystery to us. I am trying to find good books yo help me understand more. I would love to do a party as you said but I don’t know if anyone would be aloud to attend! Very true….I reckon more research would be done if that was the case! Love the ide of Period parties!! Can’t wait to try it with my second daughter. Sounds like such a lovely idea. I particularly like it because I feel it will help to embed positive internal representations in the minds of our young girls regarding having their periods if they start off in such a manner. Yes I may have a party for my youngest when the time comes! I definitely agree with you. I never understood the shame around periods. I mean it is part of our lives. The basket is a great idea Foz. As for parties, it seems to be more and more common these days, like a special celebration for a special time – a way to create a space for the young girl to know she is surrounded by women open to care and share. I really like the idea of period party. Having my period was a distressing time in my life. Had I had something similar, I would have viewed it so differently. Yes, you are absolutely right it is not a shameful thing, but many people believe it is. I’m saying this with a heavy heart in India when women have their periods I’m talking about Jain community they treat women like a dog. Women having periods cannot sit on the sofa, cannot sleep on the bed, they literally sleep in the balcony. I was very annoyed when I got to know about this ritual in the Jain community. That’s is an amazing idea. 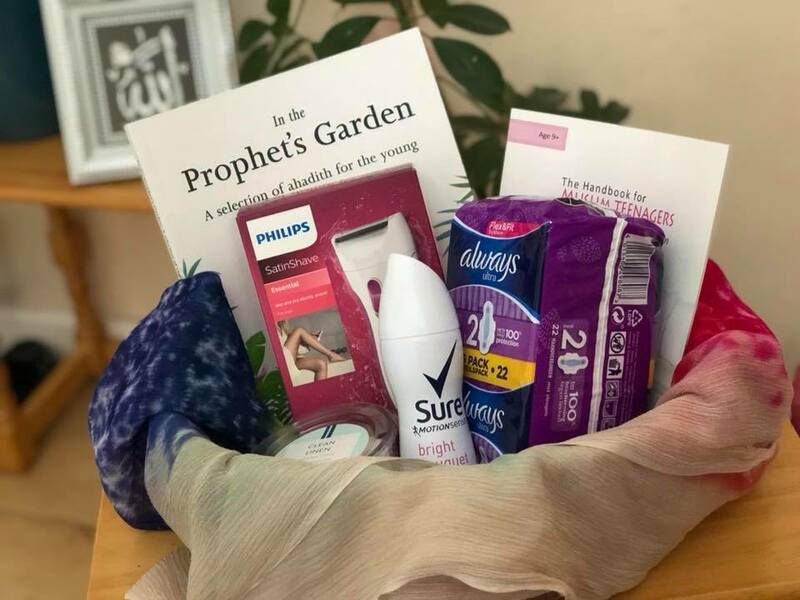 This puberty basket can be a good idea for subscription or gifting too. Being open about this is to our daughters will help them to be tension and worry free while going through this stage. True that could be a good idea! That’s thoughtful and wonderful gift…..Yeah I too have heard about celebrating this in many families…. This is such a brilliant idea and much needed too for young girls to make it easier and less traumatic for them to go through puberty. Thanks for sharing!